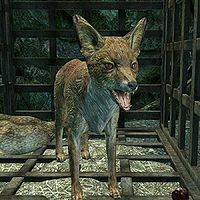 Pumpkin is the pet fox of the spellswords living in Southfringe Sanctum. He resides in a cage near a small camp site. In his cage is a dead chicken and some bloody bones. Just outside his cage are two pieces of chicken in a bowl. He is not initially aggressive, but as he is allied with the spellswords in the cave, he will try to protect them from attack if he is let out of the cage. You may use Animal Allegiance or Command Animal on Pumpkin and his hostility will be removed forever. Pumpkin has an AI package to follow you within Southfringe Sanctum. Pumpkin is just a regular fox bar the fact he is part of NecromancerFaction (unlike other foxes).